Eczema is also known as dermatitis. It is a term used to describe a group of dry skin conditions that can affect any age group. This skin problem is not contagious and although there are treatments, there is no cure. Generally, it is characterized by itchy red skin with tiny bumps or blisters and inflammation. Over time the untreated condition will lead to skin that is thick, scaly and dry. There may also be hair loss in the affected areas and changes in the colour of the skin. Severe cases include large areas of the body being affected and the presence of significant open areas and oozing fluid. 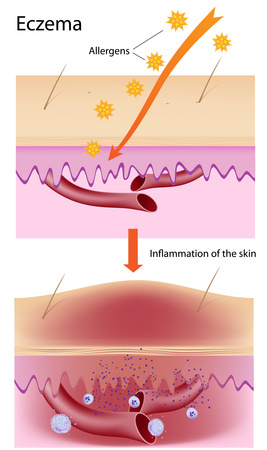 Visit the pictures of eczema page for more information on eczema. If you have an eczema story that you would like to share with other eczema sufferers, this visit this page. An individual may experience several different types of excema. The causes and treatments will vary depending of which type the individual is suffering from. For more information on treatments, please visit the cure page. For information on these conditions, please visit the dermatitis page. CAUTION: If left untreated, eventually a skin ulcer can develop. For an all natural treatment for this skin problem visit the natural cure page.